This project was great; there are a number of issues that you will also face, if you choose to investigate this more. - The arduino has 2K of RAM, and the libraries use a significant amount of this. The code stores file names in RAM; this is limited. Currently, there's a max of 20 files per directory. - Storing the filenames in RAM allows a sort function to display the mp3 files in sequence. This is essential for me, since I have audio books with chapters that obviously have to be played in sequence. 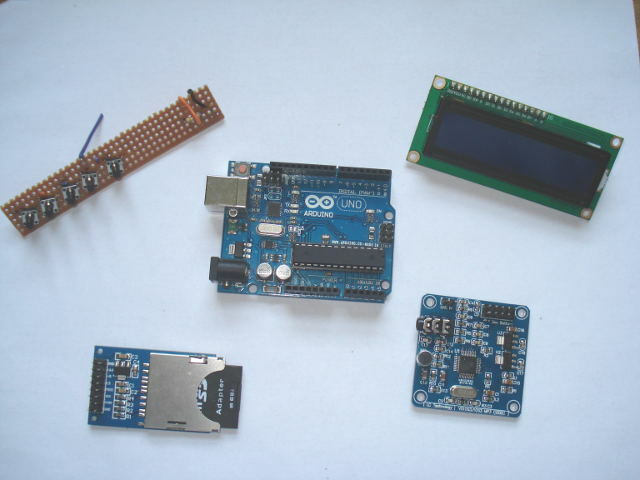 - The arduino SD library, which reads the SD card, uses 8.3 filename format. I looked at ways to support long filenames, and drew a blank once I understood more about it. Help yourself to solving this issue. - The MP3 codec board has a very important bug in it. It boots into MIDI mode. More on this issue later; it's a biggie. - The code used on the arduino Uno (development) worked differently on the Arduino Pro Mini. The code was written to deal with this; sending an MP3 file to the codec board several times forced the board to reset into mp3 mode on the Uno, not on the Pro Mini. Here is what I built, and it works so beautifully for what I need. I often update the code for this thing; if you would like the latest code version, then please just send me an email and ask for it. 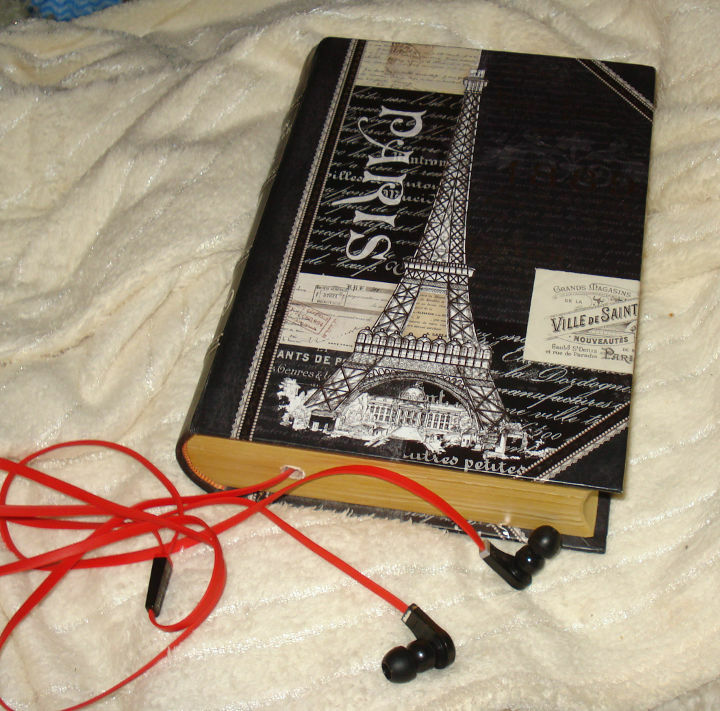 I used a cardboard hollow book as my casing for my mp3 player, with a suitable small hole drilled to allow the earphones out. Opening that nice looking box up; I used a cardboard box piece as a backing, and fixed my components using fishing wire. 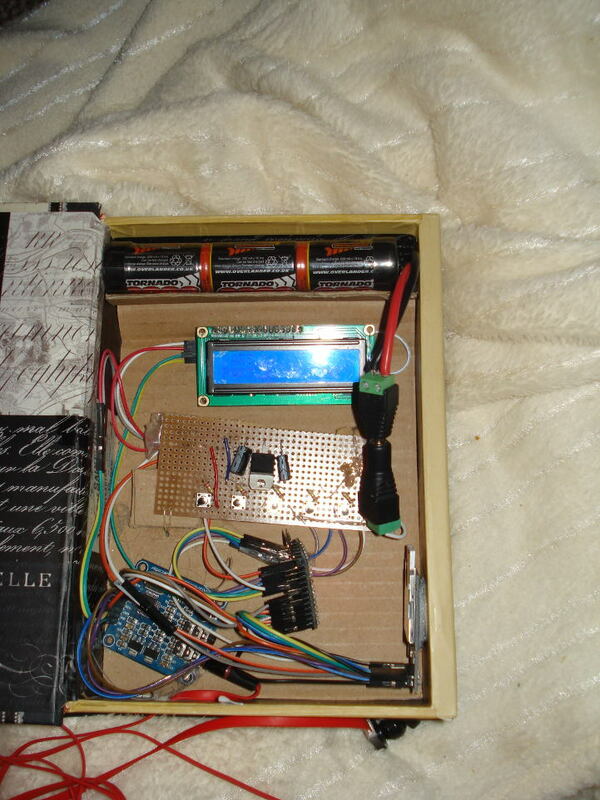 The battery (at the top) is a 7.2v 2000 mAh remote controlled car battery. It had a Tamiya ending, which I cut off and replaced with a standard thingy. Below that, you can see a small but normal LCD screen. Below that and in the middle, on the PCB, is the 5V transformer. The 7.2V battery comes into this, and 5V comes out of it. There are also 5 switches soldered in, for me to choose which song to play. 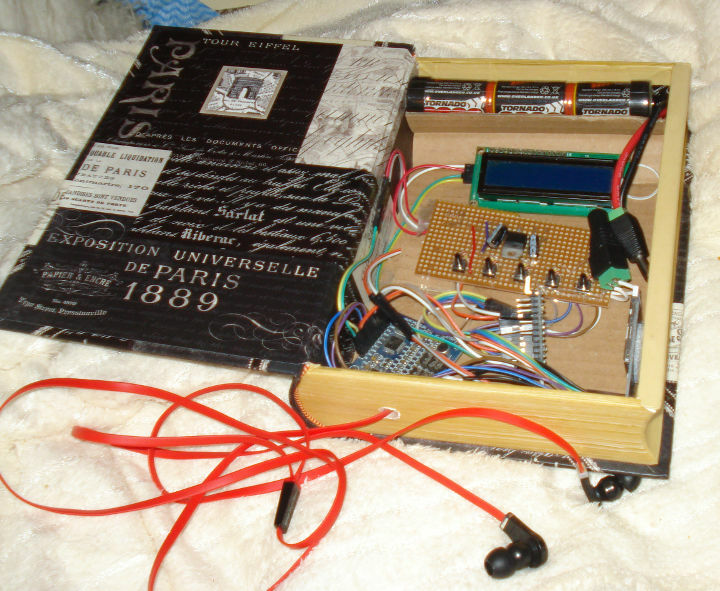 At the bottom, and from left to right, is : the vs1053 mp3 decoder with the headphones plugged in; the arduino; and velcro'ed to the side is the SD card holder. 2000 mAh lasts me about 3 days, and I have 2 batteries that I recharge in turn. Obviously, please copy some mp3 files onto the SD card first. Try a max of 10 ? And we're using the Arduino SD library, so fat32 format please. The SD card you choose should be class 6 or above, class 10 is best. This is the speed that the card can read/write at. I tested a class 4 SD card; it could not be read fast enough, which caused stuttering when trying to play a file. The first step is to plug in the SD card reader and the LCD screen, and test that these work. I'll be using a normal development breadboard as a power distribution board and for the 5 switches, until I'm happy that the components work - then, I'll solder everything into a final and permanent project. (Note: The power distribution board will take power from a battery; convert it to both 5V and 3.3V and provide ample solder points for me to power all the components). LCD (16 x 2) with I2C controller. Obvious Vcc (5v) and GND. 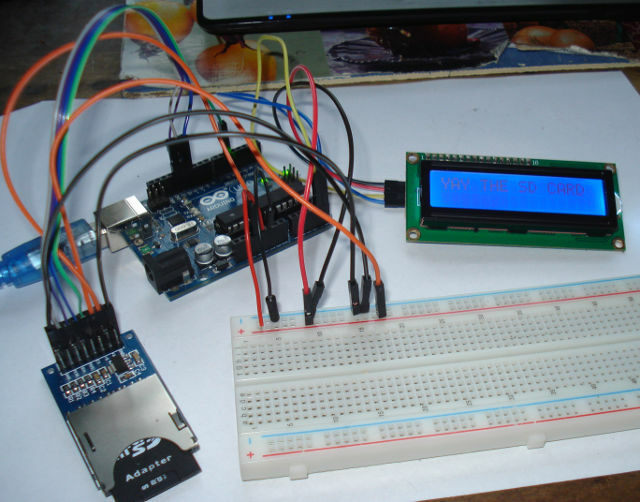 Test the LCD screen works using this basic code. SD card attached; SPI pins as detailed here, 3.3v to the arduino and 5v/GND to the dvlpmnt board. CS - connect to pin 5 ! You can test that the SD card and the LCD are working, using the following code. If it works, you will see on the LCD, the lines "Works line 1" and then the line "Yay the SD card". Also, note the use of PROGMEM to store and display strings. This makes a big memory (RAM) saving. const prog_uchar welcomeLine1 PROGMEM = "Pauls MP3 player";   // "String 0" etc are strings to store - change to suit. char myChar;    // Used throughout, to read a char/string from PROGMEM. // PAUL !!! These are the 2 lines that make it work/not work each time you do a soft reset !!! myChar = pgm_read_byte(cardError); // Necessary casts and dereferencing, just copy. myChar = pgm_read_byte(cardWorks); // Necessary casts and dereferencing, just copy. This MP3 codec board is one of the cheap variety from Hong Kong. I have got it to work, but it does contain some problems. If you want your mp3 codec board to work first time and completely, then you should consider buying a different board, such as those designed by Adafruit. The major flaw in these cheap boards is that they start up in MIDI mode. A second major flaw is that they don't respond as they should to changing bass, treble, or earphone acoustic mode. I haven't even bothered trying to make it record something. I have got mine to work successfully to play an mp3 file and change the volume - all attempts to make it sing and dance have failed. I have written more on this separately. I spent weeks poring over spec sheets and researching other people's experiences. You can see from the pic that we are starting to have a spaghetti bolognese of electronics. Hence the plan of developing this to check it all works before soldering switches and battery power supplies. Ignore the switches in this pic below until step-4. Just connect the MP3 codec board up. From the MP3 codec board, connect MOSI MISO SCK 5V and GND to the same pins on the SD card. Connect other pins as below. 5V	- Connect to the SD card 5V pin. DGND	- Connect to the SD card GND pin. MISO	- Connect to the SD card MISO pin. MOSI	- Connect to the SD card MOSI pin. SCK	- Connect to the SD card SCK pin. DREQ	- Connect to Arduino Uno pin 3. XRST	- Connect to Arduino Uno pin 7. XCS	- Connect to Arduino Uno pin 9. XDCS	- Connect to Arduino Uno pin 8. 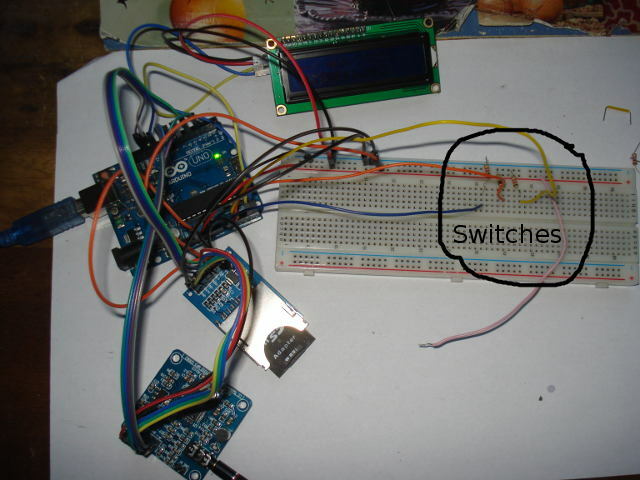 As a temporary (development) measure, the switches are wired into the breadboard. Even more temporary, only 3 out of 5 switches are needed for a test - "up, down and select." "Volume and Options" can wait. 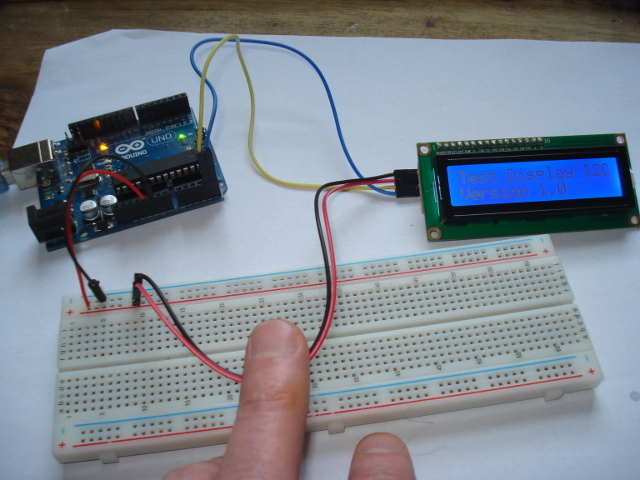 Connect arduino pins A0, A1 and A2 into the breadboard, then via a resistor to GND. This ensures the switches on pins A0, A1 and A2 are pulled low whilst the program is running. Connect another wire (pink, in this picture) to 5V. When you want to activate a switch, touch it gently to the switch wire. 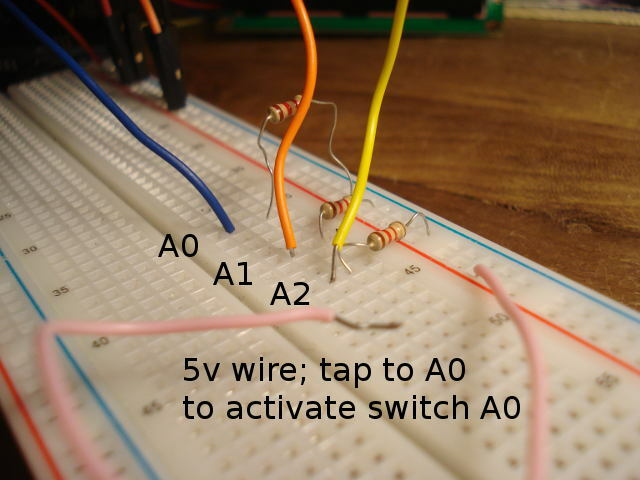 (push the wire into the breadboard, next to the switch wire is easiest). The resistor ensures that the current doesn't flow to GND; instead, the current flows at 5V into either A0, A1 or A2, sending that pin high. This is how a switch works. This code has been written by myself, and is (c) me, and I am proud of it. Please use it for yourself, and if you have the time to say Hi below, then that would be nice. I have created a .ino file to download, here; and here is the code below also. While you load the code, and test that it all works, there are some important discussion points on the next MP3 player page. //           1.20 - Only include directories and file suffix *.mp3; ignore others. byte DIR =1;    // Is the file a directory, or a playable file ? byte PLAY =2;    // Is the file a directory, or a playable file ? byte msgUpPin = A1;    // The switch to scroll messages UP - switch up/down as you want ! byte msgFifthPin = 6;    // Pin number for 5th switch. Usage ? // Menu list items: ensure MENU_END is the highest number !! byte numFilesInArray = 0; // This is the number of files; max 10 per directory. char *fileName[MAXINARRAY];  // Number of files per directory. Pointers to mallocs. // DREQ MUST BE HIGH BEFORE YOU START !!! Mp3DeselectControl();        // DEselect sets XDCS HIGH, thus ending the current operation. in register SCI_MODE). Then wait for at least 2 micro-s, then look at DREQ. player.setVolume(thisVolume); //  This should set the volume to prev value; check thisVolume. // The decodetime register must be read WHILE data is being correctly decoded. // BOOT NOT MIDI ! // set the Last Button Press, in order to dim the display. // STOP PLAYING: Close the file. // Transfer end of file wil clear the buffer out. // appropriate variables for sending the MP3 data. // HERE: Check for file being restored from backup, and set the filePos. failureToPlay = 0; // Keep a count of how many times it fails ! contains 0. A soft reset and resending the file usually works. if (noOfBytesRead < 32)    // If less than 32 bytes were read, then we're at the end of the file. //wantedDisplayStatus = DISPLAY_PLAYING; // dont set this, we want to dispay menus as well while playing. wantedDisplayStatus = DISPLAY_PAUSED; // this is wrong; we want menus whist paused also ? // Play the next file. // If we're playing MP3, then fast rewind. // NOTE DIFFERENCE IN TIME - FAST REWIND REQUIRES FASTER, BECAUSE OF TIME ELAPSING WHILST PRESSING !!! // End of the main loop. // Fifth button - used to restore the file and position that was ast backed up. // Must be in file browsing mode. // and secondly by the multiplier of the blocksPlayed. // The filenames are sorted. // Paul, switch i and i+1, using a temp pointer. // OTHERWISE theyre equal; check the next char !! // unless we're already in the root directory. fileName = (char *)malloc(3);    // Only allocate the req'd bytes ! // Is it a directory or a playable file ? else    // else assume it's an MP3. This may not be true, of course. Your choice if your SD card has non-MP3 files. // The SELECT button has been pressed. // If the display was DIM, then turn on the display and ignore the button press. // If the file type is an MP3, then play it ! // and trim the currentOpenDirectory accordingly. //Serial.println("Selected a file ! ");      // We're playing a file. // Print the list of files on the display. // We currently have a 16x2 LCD connected, so display 2 files. // Now, print the messages out to the LCD screen. // See how much RAM you have got left. I average about 390 bytes before reading the filelist. myChar = pgm_read_byte(volume); // Print a message "Volume :" on the LCD. myChar = pgm_read_byte(playingFile); // Print a message "Playing :" on the LCD. myChar = pgm_read_byte(paused); // Print a message "Paused :" on the LCD. // If we're PAUSED then stop playing. awaitDataRequest();  // PAUL!!! decode time is returning random crap ! // Dispay the DECODE_TIME : the time that the track has been playing for. // Note that this doesn' work, and I have no idea why not. // Divide by 1000, to get a suitable displayable value. // We don't need to display the time if we're (eg) changing the volume. // does give me a way of restarting a song at a known point. // This _should_ display the decode time. It doesn't. return either int or 16. // PAUL TEMP : Write a backup every n blocks. 1000 is about 3 seconds of time. return;  // DO NOTHING - eg perhaps the SD card lock is in place ? backupFile.seek(0);        // Start at 0 each time, and overwrite the first n chars; does NOT shorten file !? backupFile.close();      // NOTE: This does not shorten the backup file !!! myChar = pgm_read_byte(lowMemory); // Print a message "Low memory :" on the LCD. // If there's no backup file, then no worries. // SAMPLE FILE : This is an example; note the \r \n as the line terminators. //               Ignore all chars after the second line terminators. myChar = pgm_read_byte(restoring); // Print a message "Restoring :" on the LCD.